We are teaming up with our global partner, Cisco, to launch in a brand new city in Spain... in the beautiful capital city of Madrid! Together with Cisco, 170 girls will spend the day at Instituto de Salud Carlos III, engaging in hands-on workshops on all aspects of Science, Technology, Engineering and Math - and especially the cutting-edge innovations Cisco is known for! What? Welcoming 170 girls aged 11-15 from local communities to come and join us for a g4g Day event filled with interactive and hands-on fun in Science, Technology, Engineering and Mathematics. How? We invite role model professionals to lead 45 minute workshops that show the link to STEM; 12 - 15 girls in one workshop; a chance to experience 4 workshops throughout the day. A sneak peek at our inspiring venue for day in Madrid! Aurelia is on our advisory board for corporate partnerships and is our diversity & inclusion expert, ! She’s piloted our‘g4g@work’ concept w/ Cisco, which we will use with other companies around the world! As a “world citizen” in Brussels, she loves kitchen science and watching "The IT Crowd"! She hopes to inspire the next generation of female STEM leaders around the world! All about her launch in Jordan here! David is leading CSR and digital talent initiatives in Spain. He is a Social innovation professional, technology enthusiast and community builder with a passion for start-ups. His passion in life is to equip social entrepreneurs with the skills and resources they need to change the world. He studied Economics and loves travelling and family time. Corporate counsel at Cisco that helps the business reach their goals while ensuring Cisco stays complaint. 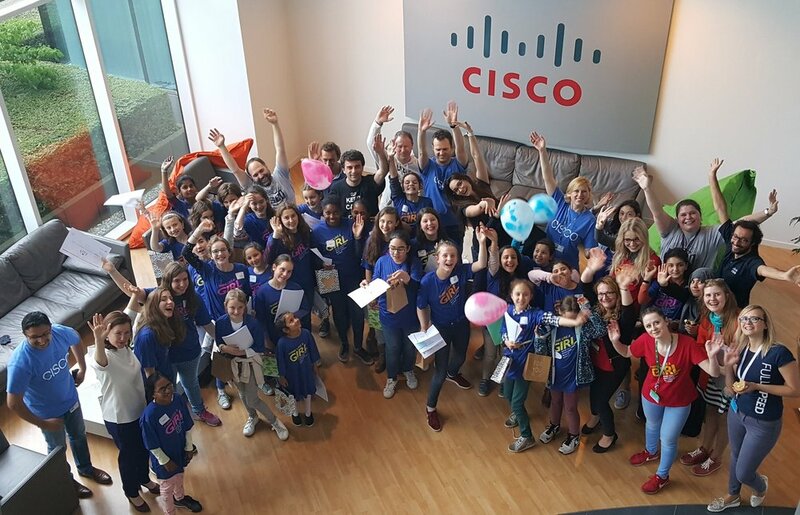 Leading volunteering activities at Cisco Spain. Visiting lecturer at various Universities in Madrid. Strong supporter and co-leader of women leadership and career development related events. Big animal lover (especially dogs), runner and a millennial who enjoys (of course) a little technology. From global communications & event coordinating, she manages various g4g internal projects, creates science workshops, supervises our lovely young interns and ambassadors and loves to lead the DNA workshop across the globe! She loves all things science, but what really gets her going is studying the core of all living things... the molecules of life! Marisol joined Cisco in August 1998, currently working as Consulting Services Engineer in the Cloud & Network Services EMEAR Center of Excellence in the Advanced Services Organization. Marisol has been participating as a Conference Speaker in Cisco WorldWide Events, providing technical inside of Cisco Network Automation features to partners and customers. An active member of Inclusion and Diversity Organization within Cisco. 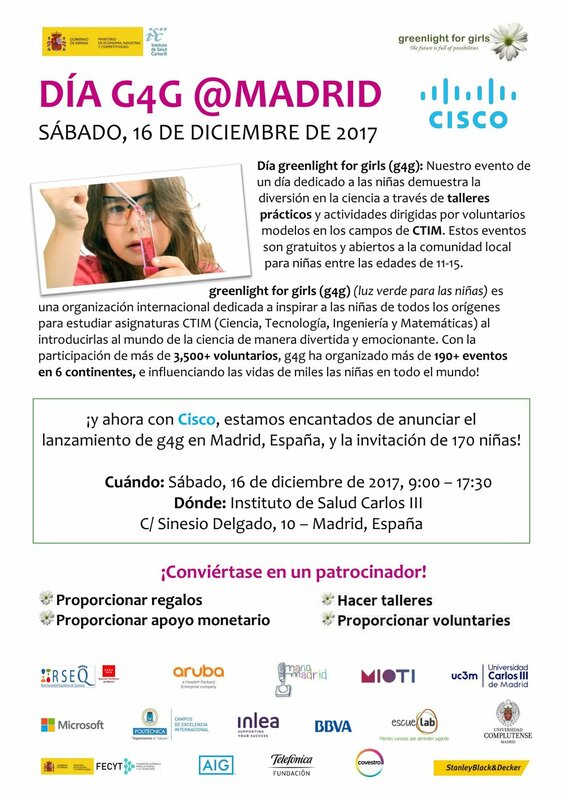 Started and leading for several years now Programa Escuela for Cisco&Conexión Employee Resource Organization in EMEAR and also actively participating in the Spanish European Women Professional Network organization since 2008. Esther is an engineer at Cisco in Data Center technology & a Project Coordinator for g4g in Barcelona! She was born in a small farmers town in Spain and always loved to play with technology. She wants to show how fun working in technology can be and to make sure that everybody is given the same opportunity to choose their career. She was awarded European Digital Woman of the year in 2014.